Â Â Â The Red-masked Conure or Cherry-headed Conure is an affectionate and playful coompanion bird. When they are hand raised they have no fear of people and will quickly become 'one of the bunch'. They make a wonderful pet! Besides being very intelligent and loveable, the Red-masked Conure or Cherry-headed Conure is a real clown and loves to show off. They are easy to tame and are good talkers. They do however have a grating call and can get quite loud. They also love to play and chew, so be sure to provide them with lots of wooden toys to keep them well occupied. The Red-masked Conure is the bird most often referred to when describing the Cherry Headed Conure, however it is one of four conures that are sometimes called the Cherry-headed Conure. This group of red-headed conures includes the Wagner's Conure, the Mitred Conure, the Finsch's Conure, and of course the Red-masked Conure. This confusion usually happens because these conures can look very similar when they are juveniles. Though generally beyond six months they can be distinguished, It does takes several years for them to get their full coloration, and then they are much easier to identify. The Red-masked Conure is the smallest and is the most colorful of these four red-headed conures. Distribution: The Red-masked Conure or Cherry-headed Conure is found in the arid zones of western Ecuador and northwestern parts of Peru. They inhabit open forests or the forest edge and are sometimes found near towns. Description: This conure has a beautiful green plumage that is paler and more yellowish on the underside. Except for the back half of the cheeks the whole head is red, completely encircling the eyes and often on the throat and neck as well. There is also red on the shoulders, underside of the wings and the thighs. The eye is yellow surrounded by a naked, creamy white eye ring. The beak is horn colored and the legs are gray. 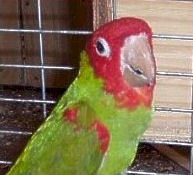 Young Red-masked Conure's have gray eyes and lack the red on the head. Size - Weight: The Red-masked Conure will reach up to 13 inches (33 cm) and weigh 5.8 - 6.5 ozs (164 - 184 g). Social Behaviors: These birds make a very warm and friendly pet. Breeding/Reproduction: The Red-Masked Conure breeds readily in captivity, though generally in the hotter part of the year. The female will lay between 3 to 4 eggs which will incubate for about 23 to 25 days. The young will fledge at about 6 weeks and be fully weaned by 11 or 12 weeks. The breeding box should be about 10" (25 cm) by 11" (28 cm) and 21" (53 cm) deep, with a 4 1/2" (11 cm) entrance. Potential Problems: As with many Aratinga species, Red-masked Conures or Cherry-headed Conures can be quite noisy. See About Conures: Potential Problems for more information. Availability: This bird is fairly available. Your best bet is to find one at a pet store or reputable breeder. Looking to purchase a Red-masked Conure Cherry-headed Conure, Red-headed Conure Family: Psittacidae please contact me if you have one. grew up with one and really would love one now. thank you so much!! email me roxan41@att.net today's date is June 24th 2017 thanks again~! Hi. I have a young cherry headed conure for sale. Hand fed. Very vibrant colors. Prefers me, tolerates rest of family. Loves mangos, grapes, apples. Asking $850.00. Pls contact me Courtneyjr29@yahoo.com if interested. Hi , I have a 35 yo Cherry Headed Conure that would like a new loving home that can offer him more attention. I am assuming that Dude is a male. He seems to prefer females, and living in the kitchen yelling “want some “ if you open the fridge, rattle a package or pots and pans. He talks a lot less now that the kids are gone, but never misses saying “good morning” when he sees me for the first time each day. But don’t let that sweet lady voice fool you. He’s very nippy and can be very loud. If you’re interested, we’ll talk. looking to buy a cherry head concure please let me know if anyone has any? thank you please email me or call me roxan41@att.net 818 942 4287 Ruzanna thank you!! I have had my Cherry head now since 1987 and he hasn't changed a bit, he is loud and nasty and bites ...everybody except me who he must think is his mother. He rarely comes out of his giant cage anymore but occasionally will crawl out and stand on top screaming. He seems quite happy and content and is always playing with his toys. He wakes up the house at 6am ish every day screaming to be fed. He eats pretty much everything and loves apples, peanuts, and yep...even chicken. He likes small pieces of rare steak and shreds it nicely and eats it. But he must have his seeds or he becomes a maniac. He has a 3 story cage and likes to climb all over it, he regularly takes baths and wets the whole room. He does not talk but he used to sing part of Flintstones cartoon Yabba Dabba Doo song but has not done so in 20 yrs. He once flew outside and was circling the sky probably about a mile away, I put my arms up and waved and he flew right back to me. Never thought I'd have him this long, hope he outlasts me. Is Lola for sale or adoption?